The sun hasn’t even broken through the frost on the backyard. The grass, the trees and everything outside has a shiny, frosted look. The bright light is peeping through my bedroom curtains, so I relent and stumble out of bed. Despite the fact that it is 33 degrees outside, I work my flip-flops on, go outside and greet my girls. They have been up for hours and hard at work. Their names (kindly named by my four-year old) are Justice (yellow, front), King (black, left), Goldie (yellow, back) and Ducky (black right). 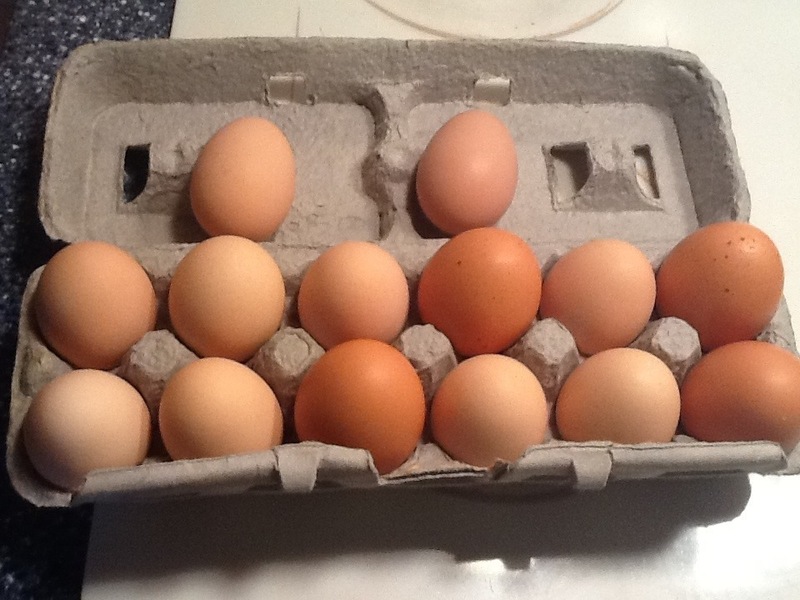 My four little hens give us four eggs a day in the summer and two or three in the winter. I don’t live out in a rural area. I live in a suburban neighborhood but my street is much more rural than many. As such, I have the opportunity to gain much more from my backyard than most people I know. When we bought the house, I knew immediately that I wanted a garden. I’ve been lucky with my garden and she has given me a decent amount of strawberries, blueberries, lettuce, potatoes, tomatoes, okra, green bell peppers, yellow squash, asparagus, a few ears of corn, a couple of pumpkins and cherries. It is my hope is that this year, I’ll be able to build a greenhouse over my 20×20 garden and get even more out of it. Last spring, while out at the farmers market, my four-year old was enchanted by a booth which sold puppies, ducks, hens, roosters and baby chickens. After a bit of research and a lot of discussion with my roommate and partner in crime, M. and I decided to purchase 4 of the baby chickens for our backyard. We put together a henhouse, kept them inside until they were fully feathered and the temps warmed up. All four survived our early parenting and went to the backyard shortly after. I have to admit that I never thought of chickens as pets. But the girls are very sweet, they come when called like dogs, and are generally less annoying than my neighbors dog which has been barking nonstop since I started writing. They can fly for very short distances, mostly horizontally. However, they make no real effort to leave the backyard. They spend most of their day free ranging around the yard picking for bugs and taking dust baths. They are great girls, and my reward isn’t half bad either! 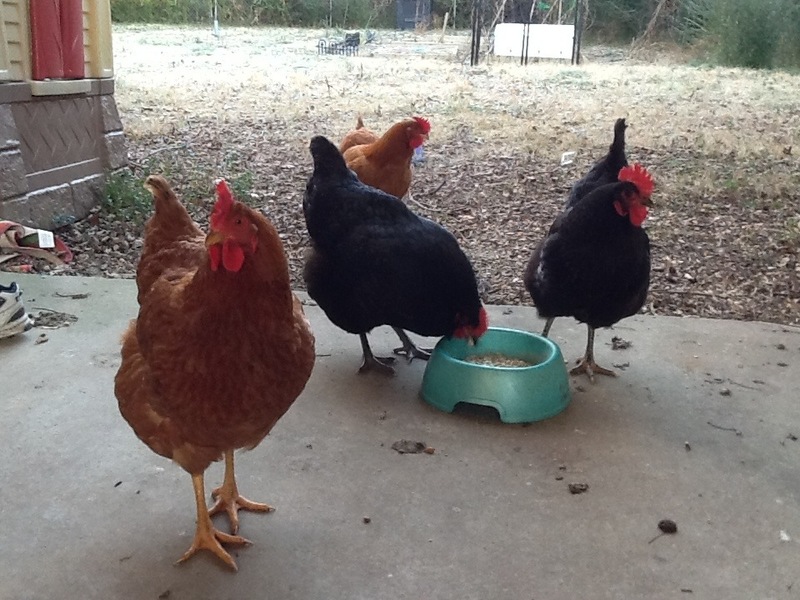 This entry was posted in family and tagged chickens, Family, gardening. Bookmark the permalink. Sounds like so much fun. Maybe I’ll have chickens someday. They really are a lot of fun. They are much easier to care for than I had anticipated.